Exploding Doughnut: Call me Mother (Plant). Commonly called Pothos and Devil's Ivy. It was the first houseplant I ever had...and it's still alive to this day. Someone gave it to my dad over 25 years ago and judging by the red and green weaved basket it came in, the plant was probably a Christmas gift. That makes sense because it was abandoned in an unheated part of the house (that we used for storage). I remember spotting it as a child--surprised it was still alive during the wintertime. I gave it some water (every now and then) and in the weeks that followed, I moved the plant into the main living room. My mom saw I took an interest in the plant and she ended up buying a small little houseplant from the grocery store as its companion. Then another (and then another) would follow. That's why I call it my "Mother Plant", not only because it was my very first plant but it led to all the others I acquired over the years. When I moved out of my family's home over two years ago, the Mother Plant was the first thing I took with me. I could never leave it behind. It then came with me when I bought my condo last year. I probably didn't keep up with its maintenance as often as I should have (due to working so much) and I slowly saw my very first houseplant looking rather sickly over these past few months. So I did the unthinkable. I cut down the Mother Plant all the way to its base...to start again. 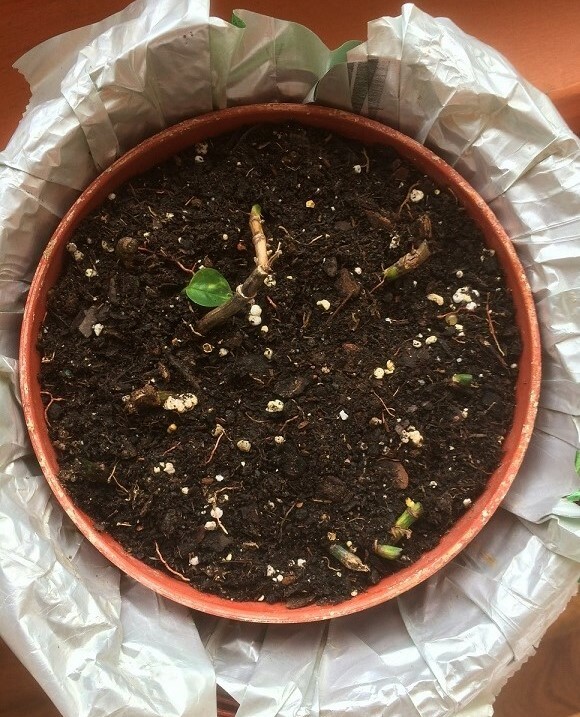 Now mind you, I could've easily rooted the cuttings trailing the floor and added them to the pot but I want the plant's original root systems to be producing the leaves, not its "children". Its roots are intact and it's a very resilient plant. I have faith it'll grow once more. "Come back to me," I whispered. Now to sit and wait for it to return to its former glory. Be sure to give us some ics as it comes back. I have a plant that has survived for 25 years, even through a move 1200 miles across Canada. 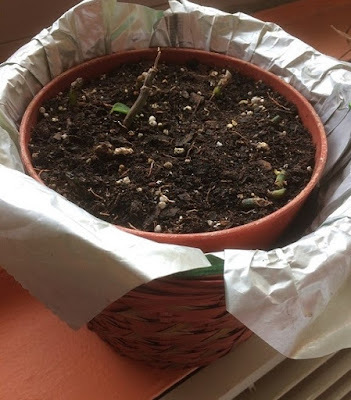 I will post photos of the plant's progress along the way! I'm glad you understand, Stan. Long live both of our plants! I appreciate both of you gentlemen stopping by here! Your pothos is most likely several individual stems in one pot (as you suggested). And you're brother is right. If left untrimmed, the pothos plant can trail for many feet. I suggest rooting the "cuttings" if you do decide to trim the plant down from time to time. You'll be able to grow them into their own plants and then either keep them or give them away as gifts!